When I first started to think about what I wanted to say here today, I thought I’d talk about innovation and how confused if not backwards the ed-tech industry’s obsession with that term is. I thought I’d tie in Jon Udell’s notion of “trailing edge innovations,” this idea that some of the most creating and interesting things don’t happen on the bleeding edge; they’re at a different perpendicular, if you will. Scratch – and before Scratch, LOGO – work there, tinkering from that angle. So I started to think about movements from margin to center, about cultural, social, political, pedagogical change and why, from my vantage point at least, ed-tech is stuck – stuck chasing the wrong sorts of change. We’ve been stuck there a while. This is me and my brother, circa Christmas 1984. (I know it’s Christmas because that’s when we got the computer, and in this photo it hasn’t yet been moved to the basement.) We found this photo when we were cleaning out our dad’s house this summer. Yes, that’s us and the LOGO turtle. My thoughts about this photo are pretty complicated: going through family photo albums, you can see – sometimes quite starkly – when things change or when things get stuck. This photo was from “the good times”; later images, not so much. And this photo reminds me too of a missing piece: somehow my interest in computers then never really went anywhere. I didn’t have programming opportunities at school, and other than what I could tinker with on my own, I did t get much farther than basic (sic). So I want to talk to you today about how we – ed-tech – get unstuck. Someone asked me the other day why I’d been invited to speak at a conference on Scratch. “What are you going to say? !” they asked, (I think) a little apprehensively. Their fear, I have to imagine, was that I was going to come here and unload a keynote equivalent of 1984’s “Two Minutes of Hate” on an unsuspecting European audience, that I would shake my fist angrily and loudly condemn the Scratch Cat or something. Or something. 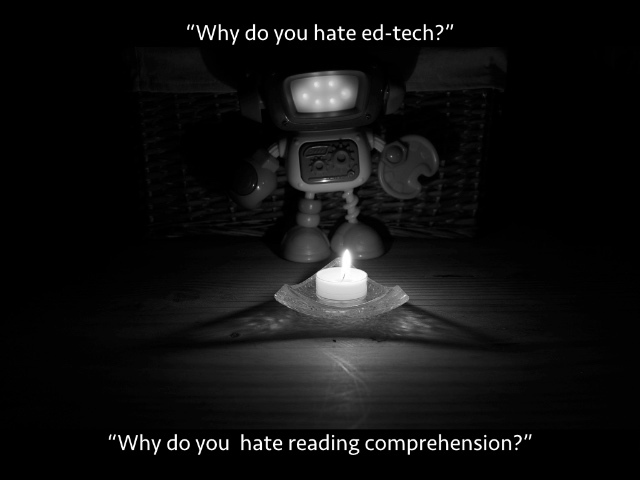 I’d contend that this nervous, sometimes hostile reaction to my work highlights a trap that education technology finds itself in – a ridiculous belief that there can be only two possible responses to computers in education (or to computers in general): worship or hatred, adulation or acquiescence. “You’re either with us or against us”; you’re either for computers or against computers. 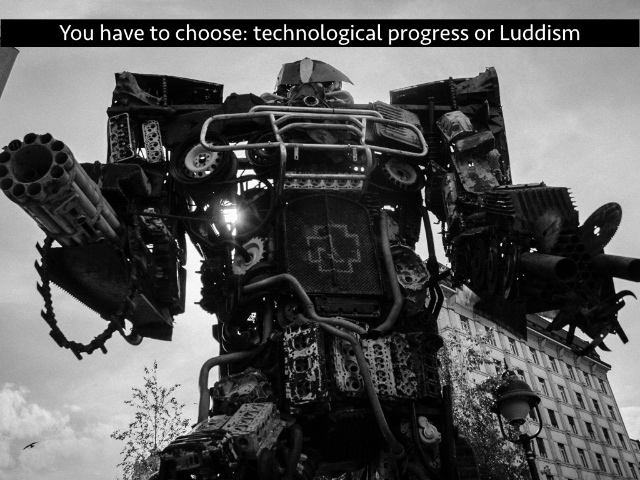 You have to choose: technological progress or Luddism. It’s a false choice, of course, and it mostly misses the point of what I try to do in my work as an education technology writer. Often what I’m trying to analyze is not so much about the actual technology at all: it’s about the ideology in which the technology is embedded, encased and from which it emerges; and it’s about what shape technologies seem to think teaching and learning, and the institutions that influence if not control those, should take. To fixate solely on the technology is a symptom of what Seymour Papert has called “technocentric thinking,” something that he posited as quite different from what technology criticism should do. Technocentrism is something that technologists fall prey to, Papert contended; but it’s something that, just as likely, humanists are guilty of (admittedly, that’s another unhelpful divide, no doubt: technologists versus humanists). 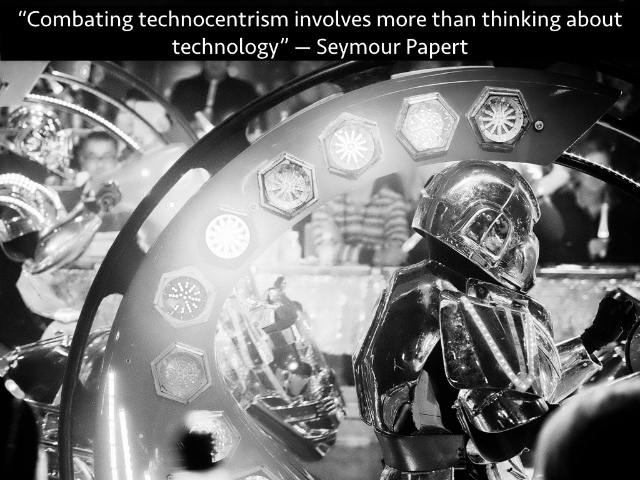 “Combating technocentrism involves more than thinking about technology,” Papert wrote. And surely this is what education technology desperately needs right now. Why, for example, is there all the current excitement about ed-tech? Surely we can do better than an answer that accepts “because computers really matter now.” Why are venture capitalists investing in ed-tech at record levels? Why are schools now buying new hardware and software? Try again if your answer is “because the tech is so good.” A technocentric response points our attention to the technology itself – new tools, data, devices, apps, broadband, the cloud – as though these are context-free. Computer criticism, as outlined by Papert, demands we look more closely instead at policies, profits, politics, practices, power. Because it’s not “technological progress” than demands schools use computers. Indeed, rarely are computers used there for progressive means or ends at all. These passages comes from a 1987 essay “Computer Criticism vs. Technocentric Thinking,” in which Papert posited that education technology – or rather, the LOGO community specifically – needed to better develop its voice so that it could weigh in on the public dialogue about the burgeoning adoption of computers in schools. But what should that voice sound like? It had to offer more than a simple “pro-computers in the classroom” stance. And some three decades later, I think this is even more crucial. Uncritical techno-fascination and ed-tech fetishization – honestly, what purpose do those serve? “There is no shortage of models” in trying to come up with a robust framework for computer criticism, Papert wrote back then. “The education establishment offers the notion of evaluation. Educational psychologists offer the notion of controlled experiment. The computer magazines have developed the idiom of product review. Philosophical tradition suggests inquiry into the essential nature of computation.” We can still see (mostly) these models applied to ed-tech today: “does it raise standardized test scores?” is one common way to analyze a product or service. “What new features does it boast?” is another. These approaches are insufficient, Papert argued, when it comes to thinking about ed-tech’s influence on learning, because they do nothing in helping us think broadly – rethink – our education system. I am, admittedly, quite partial to this framing of “computer criticism,” since it dovetails neatly with my own academic background. I’m not an engineer or an entrepreneur or (any longer) a classroom educator. I see myself as a cultural critic, formally trained in the study of literature, language, folklore. I’m interested in our stories and in our practices and in our cultures. One of the flaws Papert identifies in “technocentrism” is that it gives centrality to the technology itself, reducing people and culture to a secondary level. Instead “computer criticism” should look at context, at systems, at politics, at power. 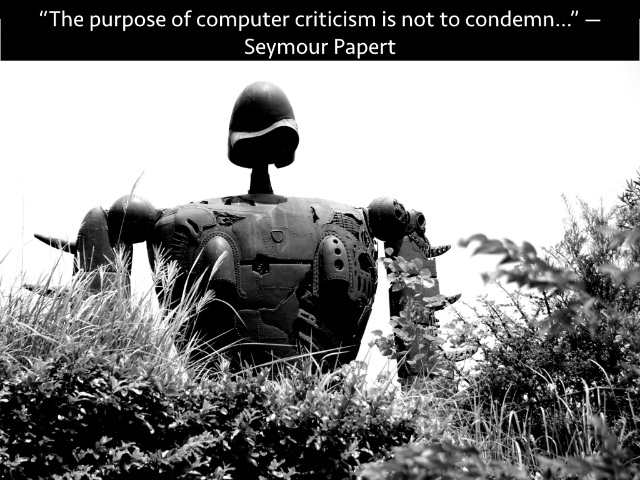 I would add to Papert’s ideas about “computer criticism,” those of other theorists. Consider Kant: criticism is self-knowledge, reflection, a counter to dogma, to those ideas that powerful systems demand we believe in. Ed-tech, once at the margins, is surely now dogma. Consider Hegel; consider Marx: criticism as antagonism, as dialectic, as intervention – stake a claim; stake a position; identify ideology. Consider Freire and criticism as pedagogy and pedagogy as criticism: change the system of schooling, and change the world. That is a knotty problem, I think, for a group like this one to wrestle with (and why we need ed-tech criticism!). If we believe in “coding to learn” then what does it mean if we see “code” as distinct from or as absent of criticism? And here I don’t simply mean that a criticism-free code is stripped of knowledge, context, and politics; I mean that that framework in some ways conceptualizes code as the opposite of thinking deeply or thinking critically – that is, coding as (only) programmatic, mechanical, inflexible, rules-based. What are the implications of that in schools? Technocentrism won’t help with thinking through that question. Technocentrism would be happier talking about “learning to code,” with the emphasis on “code” – “code” largely a signifier for technological know-how, an inherent and unexamined good. Papert offers an activist critique. Criticism is activism. Criticism is a necessary tactic for this community, the Scratch community specifically and for the ed-tech community in general. It was necessary in 1987. It’s still necessary today – we might consider why we’re still at the point of having to make a case for ed-tech criticism too. It’s particularly necessary as we see funding flood into ed-tech, as we see policies about testing dictate the rationale for adopting devices, as we see the technology industry shape a conversation about “code” – a conversation that focuses on money and prestige but not on thinking, learning. Computer criticism can – and must – be about analysis and action. Critical thinking must work alongside critical pedagogical and technological practices. “Coding to learn” if you want to start there; or more simply, “learn by making.” But then too: making to reflect; making to think critically; making to engage with the world; it is from there, and only there, that we can get to making and coding to change the world. 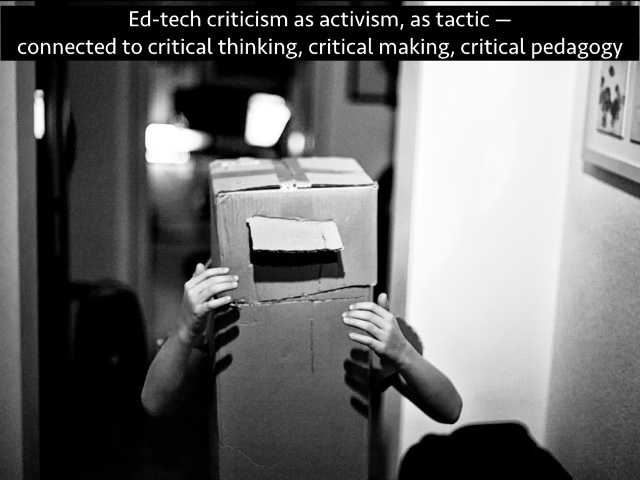 Without ed-tech criticism, we’ll still be stuck – stuck without these critical practices, stuck without critical making or coding or design in school, stuck without critical (digital) pedagogy. And likely we’ll be stuck with a technocentrism that masks rather than uncovers let alone challenges power.